The 10 Best Steakhouses in Washington State! Whether you’re on the hunt for a rustic atmosphere or a chic, upscale spot to sink your teeth into a prime cut of beef, Washington State has it. It doesn’t matter if you’re searching for a juicy sirloin or the perfect T-bone, Washington’s first-rate steakhouses have it. Here are our 10 favorites. Ricardo’s Kitchen and Bar in Lancey says it best themselves as “a place for steak… period.” And this manifesto rings true as you walk through the doors to see some of the finest plated meat anywhere... period! The pink Himalayan salt cellar is where they dry age some serious cuts of meat, after the highly controlled and artistic process of dry ageing which tenderizes and brings out the natural beef flavors, they cook it up to perfection for a truly transcendent experience. Girin Steakhouse in Seattle approaches steak from a Korean expression not found easily in the northwest. Enjoy the cool and clean exposed wood atmosphere and get swept away to a place of sizzling bliss. This take on steak has locals and travelers alike raving for more. Churchill’s Steakhouse in Spokane gives restaurant goers a hands-down amazing steak eating experience. The authentic Chicago-style eatery has a persistent pursuit for perfection in crafting their steaks, the New York strip and the filet mignon are their most popular cuts, so make sure to make two trips and try both! Look no further for the finest selection of top quality and rare cuts of beef to be served at perfection for your complete enjoyment. John Howie Steak in Bellevue is a must! With options ranging from grass fed dry aged USDA beef, to American, Australian and Japanese wagyu, which is the most beautifully-marbled beef you’ll see. This landmark fine-dining destination has been offering amazing Pacific Northwest fare since the 1950s. Canlis in Seattle is the recipient of two James Beard awards and has been praised as the bastion of Seattle fine dining. And according to the New York Times, the Canlis salad, when properly prepared, is a revelation. Come and dine! The Brooklyn Seafood, Steakhouse and Oyster Bar in Seattle offers a lively atmosphere and delicious surf and turf that keeps people coming back for more. Enjoy a wide variety of cut meats alongside a formidable wine and beer list. And according to customers, the Brooklyn never ceases to amaze. Enjoy a prime cut of steak in a clean and amazing environment overlooking beautiful scenery, Clinkerdagger in Spokane is featured in Opentables’ “100 Most Scenic Restaurants in America.” As well as having received multiple accolades from the community it represents. This classic American grill serves up some of the finest steaks in the Eastern Washington region. 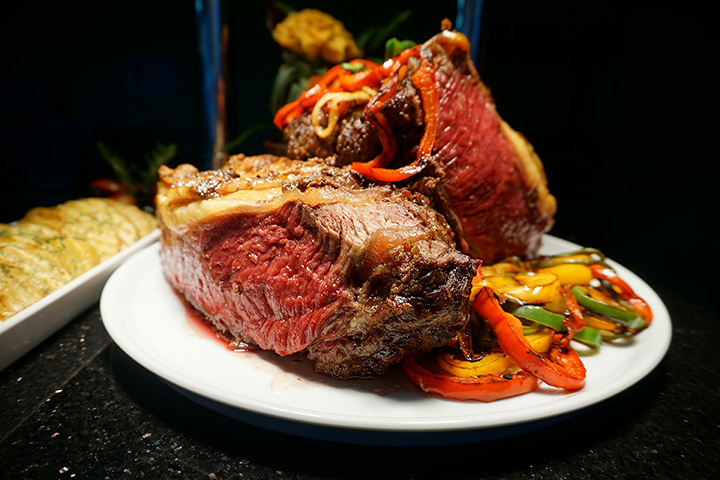 The Steakhouse at Silver Reef in Ferndale boasts amazing award-winning steaks for any meat connoisseur. Their steaks are specially selected and naturally aged, creating an incomparable tenderness and flavor. Broiled at 1800 degrees and served with a delicious steak butter, each plate is worth the expense. To pair with your steak, an exhaustive option of wines is available. Set in Seattle, Metropolitan Grill is a classy steakhouse featuring wood, brass, velvet decorations and a 60-foot marble bar. The grill serves delicious cuts of dry-aged beef, 100 percent Mayura Station Australian wagyu, and excellent sides such as pastas and salads. To complete the experience, included is an extensive wine list—of which is the awarded Wine Spectator “Best of Award of Excellence.” With over a century of wisdom in wine, the Metropolitan is the place to go.